Simple, fruity, light, refreshing and delicious. I let mine steep for 3 days to let the flavors come together nicely. Any comments, suggestions and additions are highly appreciated. This recipe is the property of Evilin and released under the CC Attribution-Noncommercial 4.0 license. You may not copy, derive or commercialize this recipe without following the terms of this license or the explicit permission of the creator. I always love FA Fuji and FA Kiwi paired together. They’re so complimentary and refreshing. 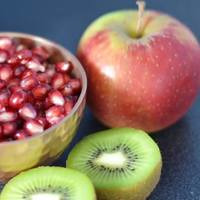 Kiwi brings extra tartness to the apple, while the pomegranate adds an almost floral accent. The balance is fantastic, and nothing is taking over nor underutilized. Thanks for sharing, Evilin! This will make a nice summer ADV when it gets a little warmer outside, I really enjoyed this one. The pomegranate adds just enough of something interesting without getting all weird.